Still nothing on live mackerel baits. I've now spent two or three hours in all letting mackerel tow my big hook round the ocean, all to no avail. However, my son Richard is over from Brazil with his family and we've done a few early morning sessions as well as an evening after mullet. 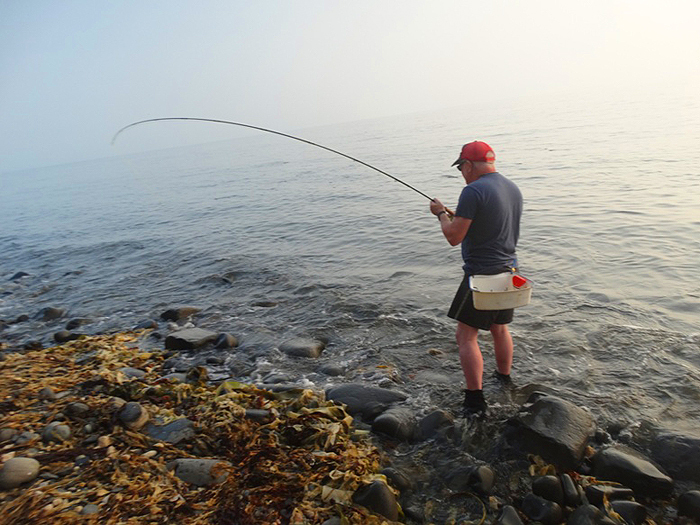 The main objective was for Rich to catch a few fish and he has clearly picked the right week because by now he's caught seven species including a best mullet of over six pounds (jammy devil). I'll try to give a flavour of the sessions. Oh! He's also had several seatrout including his best ever so I'll give an account of that in the Freshwater page soon." 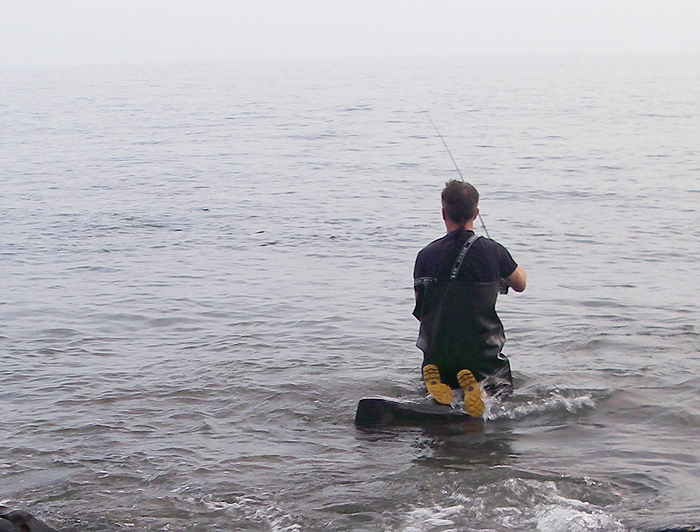 On the first morning we fished a tide race with my pal Rob. Rob was mostly fishing a fly which resulted in six scad and four bass (fly) plus a couple of bass on a lure. Richard had eight bass but all the bass were small. I tried a big Slandra and then a skitter pop but despite lots of baitfish activity and strikes from small predators both proved useless and I blanked. We could see fish on the surface from the word go and we all had bites with the fly scoring early with the scad although Richard killed the scad fishing by threatening to live bait with one. After he’d geared up to do it Rob couldn't catch another one (only small bass). The following morning Richard and I tried the same spot again. This time totalling ten bass, two scad, fifteen pollack, two wrasse and a garfish. 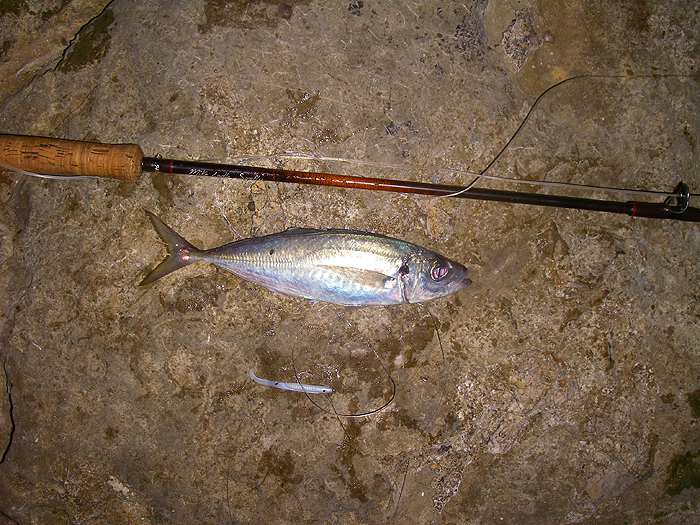 All the fish were taken either on fly gear armed with a small white Delta eel or on a black and silver J9 Rapala. Again there were loads of small fish present and massive shoals of sprats. None of the fish were large although Richard had a very big scad on the Rapala. 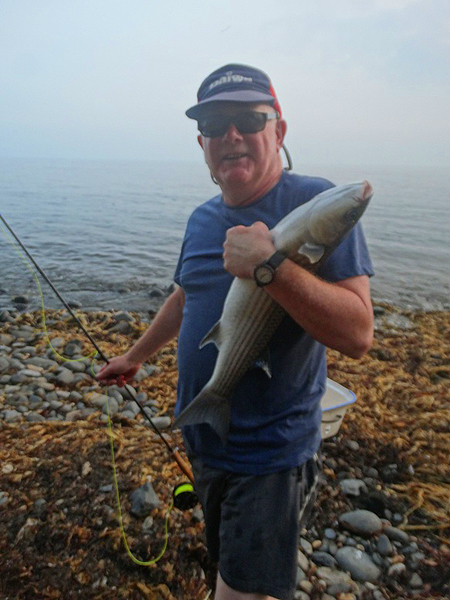 After the storms of the previous week there were loads of rotting weed middens on many beaches so we had an evening along with Nigel and Bill after bass and mullet at high water. Bill and I blanked spinning for bass but Nigel had a small bass and mullet of 4lb and 6lb on maggot flies while Richard fly fishing with a tiny Delta eel managed another small bass and a mullet of 6.5lb. Excellent! The next morning Richard and I were again fishing the dawn tide from the rocks. This time we had six mackerel, eight scad, nine pollack and a garfish using a single hooked wedge a Delta fly and a live mackerel. The pollack this time were a decent size (for a change). 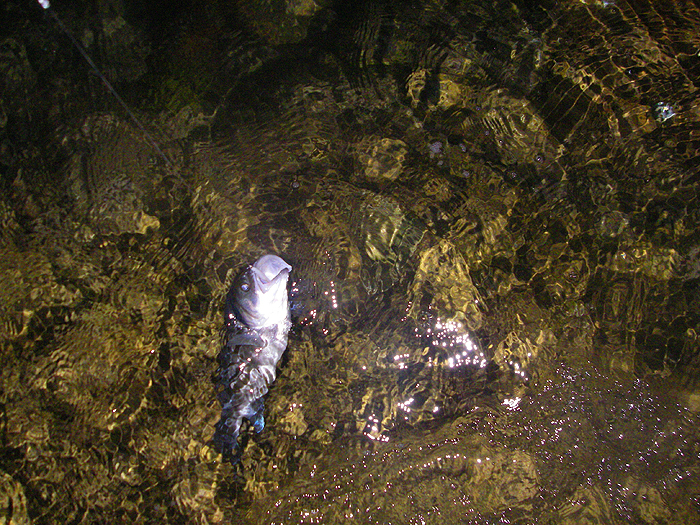 The livebait, which I fished for most of the time, again produced nothing. Will I never learn?Anyway, as far as my son is concerned it's "Mission accomplished."